Here my latest look at the list of top contenders for the 2019 Kentucky Derby to be run on May 4th at Churchill Downs. All points-scoring races have been run so no further points can be earned, although some horses could drop out due to illness or injury. Entries for the Kentucky Derby will close and post positions will be drawn on Tuesday April 30. Below is a list of top contenders with their trainer, jockey, and dosage index. The Experimental Free Handicap was discontinued this year, so there are no more dual qualifiers. Each horse names links to a profile with lots of info and a photo. Jockey assignments are based on who has been riding each horse and will change as jockeys make commitments now. The early Triple Crown nominations, which cost $600, closed in January with 369 horses, and only 4 late nominations, which cost $6000, were made on April 1. That was the last chance to be eligible without a high supplement fee, but with rule changes a couple of years ago. late supplements will have the same priority as the nominees if anyone wants to pay the $200,000 fee. Kentucky Derby Points List - this is what determines which horses can get in the Kentucky Derby field. Triple Crown Trail - 2019 prep race schedule with results for all the races. Kentucky Derby Tickets - See what is for sale on Ebay. Includes tickets and parking. 2019 Kentucky Derby And Oaks Security - New enhanced stricter rules with no onsite parking were enforced in 2018, and are in effect again this year. Be sure to read the rules if you are attending. There will still be magnetic wand searches of all patrons and many things are no longer allowed. Check here to make sure you don't bring anything they will confiscate. Kentucky Derby Future Wager - This year there are 4 pools starting in November of 2019 plus a single pool for the Oaks. Kentucky Derby Prep Races - What races should a horse prep in to win the Kentucky Derby? Some races may seem obvious, but have not produced a Derby winner in many years. Find out which races are the best preps here. Kentucky Derby Winners and Auction Prices - Bigger may seem better, but in the case of Kentucky Derby horses who sold at auction, less is more. Here is a look at how (badly) high priced auction purchases have done in the Kentucky Derby and the auction prices for this year's top Derby contenders. Review: Triple Crown Handicapper 2019 - by Jim Mazur. Includes lots of stats for all 3 races and explains how to use a system of statistically derived negative angles to eliminate the "bad" picks. Revamped for 2019 with updated info. 2019 Triple Crown Nominations - 369 horses were nominated by the January early deadline. Kentucky Derby Traditions - Find out all about the big Derby Traditions: the rose garland, the trophy, the Twin Spires, mint juleps, singing "My Old Kentucy Home", fancy hats, celebrities and the annual Derby glasses. Fillies in the Kentucky Derby - a look at the 39 fillies who have contested the Run for the Roses and how they did. So far there have been 3 wins, 2 seconds, and 5 thirds. 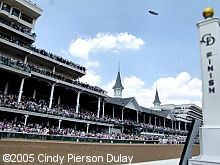 DRF Kentucky Derby Special - Lots of good info like past winners preps, contenders, past performances, and latest news. Review: Kentucky Derby Greatest Moments - Commemorative DVD from Churchill Downs with video from 27 different runnings along with interviews, photos, and historical info. Definitely recommended for any racing fan! Review: Churchill Downs - America's Most Historic Racetrack by Kimberly Gatto. An entertaining and informative account of the history of the track and it's most famous race, the Kentucky Derby, with lots of photos. Definitely recommended. Who will win the 2019 Kentucky Derby? Improbable Bob Baffert 4.23 Irad Ortiz Jr.
Plus Que Parfait Brendan Walsh 2.47 Ricardo Santana Jr.
Signalman Kenneth G. McPeek 3.80 Brian Hernandez Jr.
Review: Betting the Kentucky Derby - How to Wager and Win on America's Biggest Horse Race by Dean Keppler. Breaks the task of handicapping the Derby into easy to understand strategies that any bettor at any level of play can implement and gives strategies for wagering as well. Kentucky Derby Betting - Tips on how to handicap the Derby from Predict Em! and handicapper Kenneth Strong. Theories On Picking The Kentucky Derby Winner - a list of many angles people or try to use to pick a Derby winner from dosage to X-factor. Why not play the contrarian on Derby Day - From American Turf Monthly for a past Derby, but lots of angles and tips toward the end of the article. How to handicap the Derby, a 10 step program - From KY Hoofs, done for a past Derby but the techniques are still good.